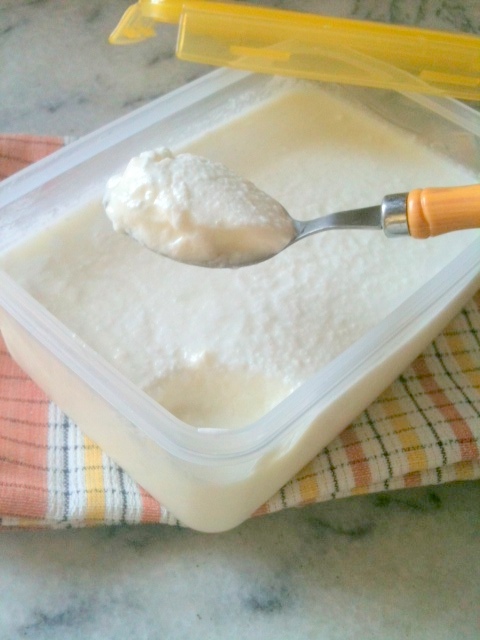 Yogurt is one of the most eatable things in every corner of the world, its cold-effects reduce the effect of heat in summers, especially in Pakistan, “lasi” is made with yogurt to kill the summer heat. I have always seen all the women in my family making yogurt at home, and I follow their footsteps. Its only very rare that we use a store bought yogurt…. Bring Milk to a boil on the stovetop. Use preferably whole milk to get a thick consistency of the yogurt. Allow Milk to cool to slightly warmer than Luke warm, if you use to hot milk it will kill the bacteria’s in culture and your yogurt won’t set or will be too sour. Transfer the milk to the container with a tight fitting lid, add the starter yogurt to the milk and stir it (you can also whisk it to get a slight froth). Cover the container with a kitchen towel and leave it to set for 5-6 hours preferable in a warm place such as a cupboard or oven. After 5-6 hours take it out and check it. If you feel its set place it in the fridge for 2 – 3 hours before using it. You have to close the container with lid n than put paper towel or just cover it with paper towel?